Canadians produce 35 million tons of garbage every year, 80 percent of which winds up in a landfill or incinerator. 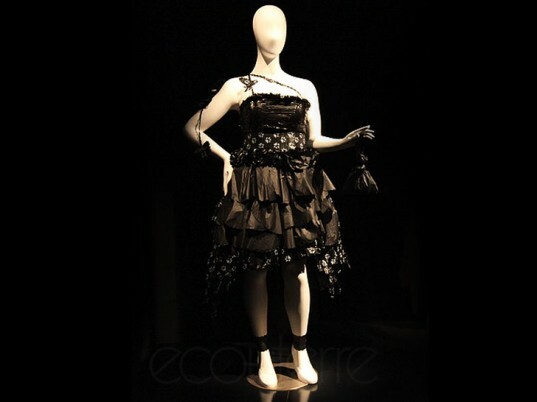 To illustrate the bewildering quantity of waste, as well as draw up possible solutions for diverting it, Environment Canada challenged 16 artists from the fields of fashion, hairstyling, cabinetry, and the visual arts to transform post-consumer refuse into cutting-edge couture. Currently on display at the Biosphere Environmental Museum in Montreal, O.N.E. Outfits From a New Era underscores important environmental concerns with the castoffs of society, including building materials, batteries, salmon skins, and plastic bags. 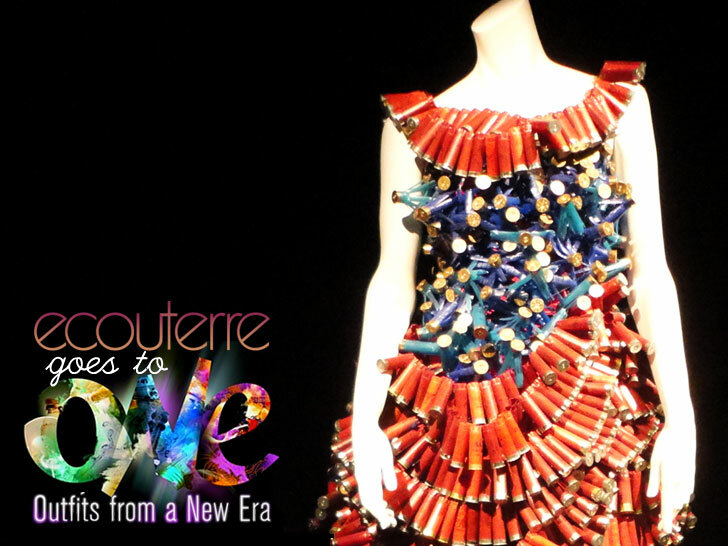 Above, Geneviève Dumas and Geneviève Flageol's "Bullet Dress" makes a statement with 2,000 fired shotgun shells. Borrowing cues from the past lives of the materials, each work is accompanied by a short film, a soundtrack, or pieces of trash autographed by Canadian public figures such as Robert Lepage, George Stroumboulopoulos, Julie Payette, and Guy A. Lepage. 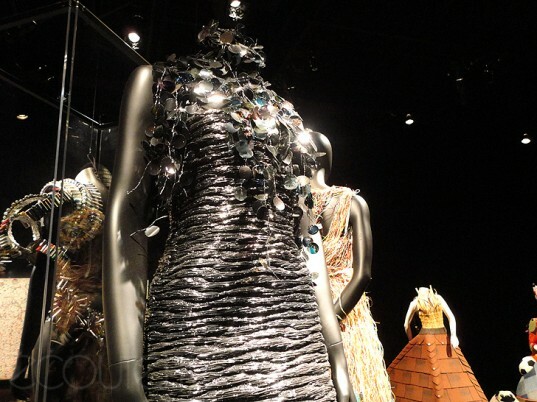 In turn, the exhibit inspires visitors to see the beauty in what we throw away. The project also incited a desire for personal change in the artists themselves, who were transfigured by their participation. Majorie Labrèque-Lepage, who makes decorative plush toys, crafted her “Plush Empress” from four sweaters, seven pairs of jeans, and 100 buttons. For her “Bag Garment,” jewelry designer Mélanie Casavant hot-pressed 200 biodegradable and oxo-biodegradable garbage bags to create sheets of compressed plastic fabric. 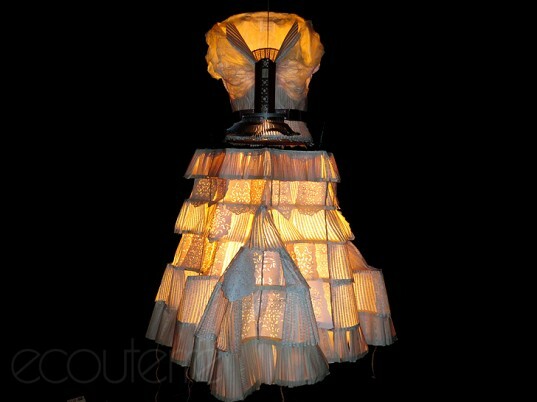 Marie Line, an artist who first discovered the artistic potential of trash as a child, made a glowing crystalline “Pillbox Dress” from 6,800 pill bottles, collected from Montreal locals. Chloe B. Fortin used 72 yards of stripped copper wire to string 2,500 damaged Christmas lights in long chains reminiscent of Buddhist prayer beads. 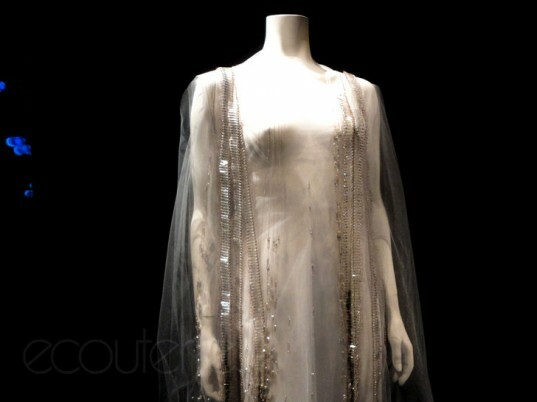 Melissa Turgeon, a fashion designer well-versed in clothing recovery, used six computer mice, 120 cables, and half a computer keyboard for her futuristic “Haute Couture 2.0” evening gown. 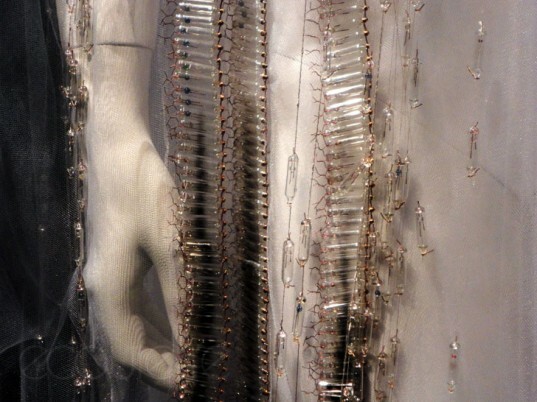 The “Caustic Swimsuit” by Jennifer Bergeron gets a charge from 1,200 alkaline batteries, which, if statistics hold true, still contain a third of their power. For her “Hit Parade” cocktail number, textile artist Valérie Bédard salvaged 870 yards of video tape; 870 yards of audio tape; 2,000 slides; and two seconds of 35-millimeter film. The hauntingly luminescent “Chapter 10: Words & Wonder” by paper artist Geneviève Oligny features 1,796 pages from 78 books, milled paper, sheet of wood, linen rope, binders, and typewriter parts. 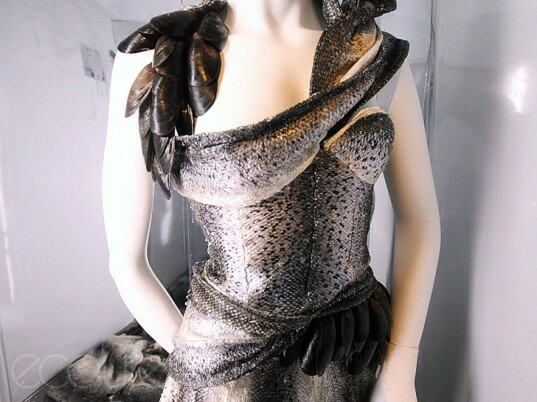 Holding court in a refrigerator is Geneviève Bouchard’s “Mermaid Skin,” a daring dress stitched from 97 discarded salmon skins, 320 yards of fishing line, and 40 mussel shells. 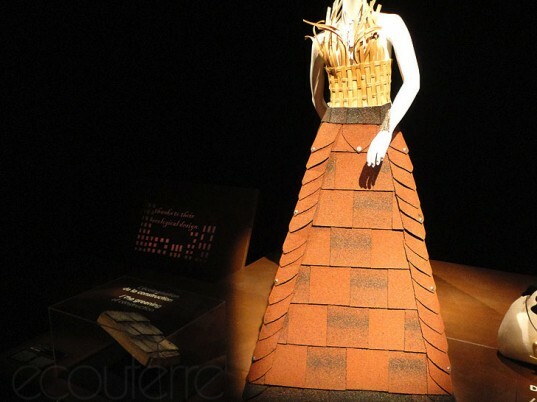 Stéphanie Lévesque, a multidisciplinary artist with a diploma in cabinetry, built her dress from 54 pieces of asphalt shingles, eight sheets of plywood, and 20 nails. 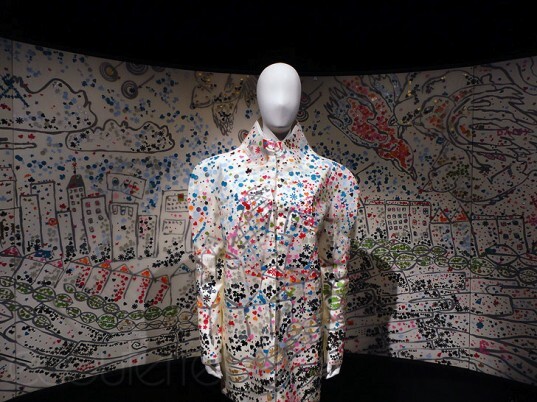 Isabel Vinuela used a sheet of canvas and splatters of paint to depict the 243 million liters of paint that Canadians purchased in 2009 alone. 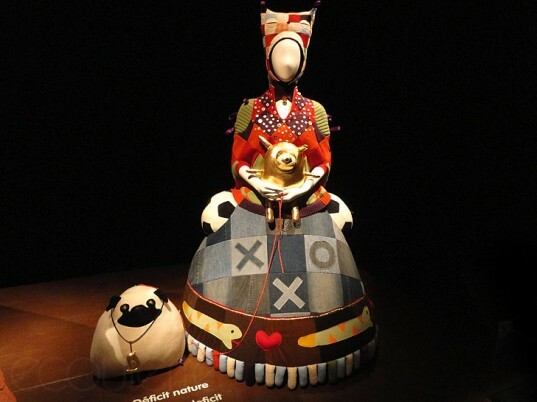 Majorie Labrèque-Lepage, who makes decorative plush toys, crafted her "Plush Empress" from four sweaters, seven pairs of jeans, and 100 buttons. For her "Bag Garment," jewelry designer Mélanie Casavant hot-pressed 200 biodegradable and oxo-biodegradable garbage bags to create sheets of compressed plastic fabric. Marie Line, an artist who first discovered the artistic potential of trash as a child, made a glowing crystalline "Pillbox Dress" from 6,800 pill bottles, collected from Montreal locals. "Each bulb is an opportunity to release tension, fear, hope, expectation and judgement," she says. "It is also a time of abandonment, and then a moment of attention and presence." 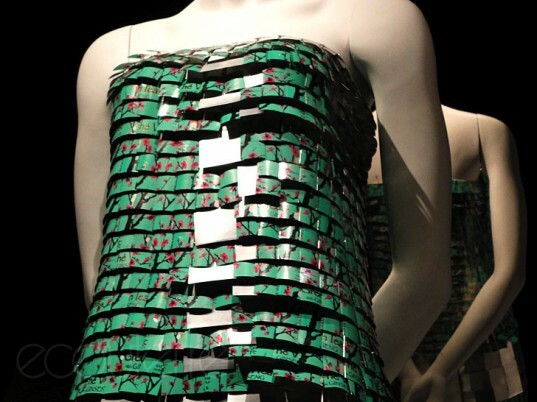 Maude Lapierre snipped 75 AriZona ice-tea cans to whip up a Paco Rabanne-style "Charlestea Dress." 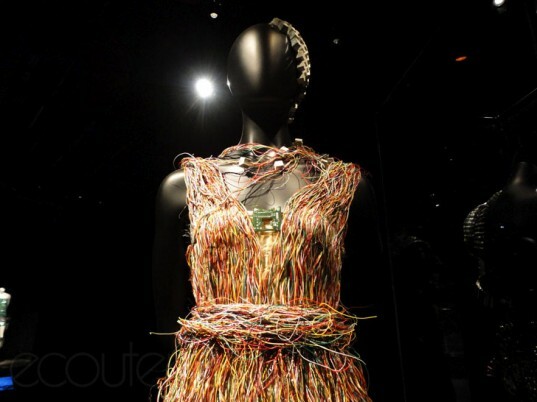 Melissa Turgeon, a fashion designer well-versed in clothing recovery, used six computer mice, 120 cables, and half a computer keyboard for her futuristic "Haute Couture 2.0" evening gown. 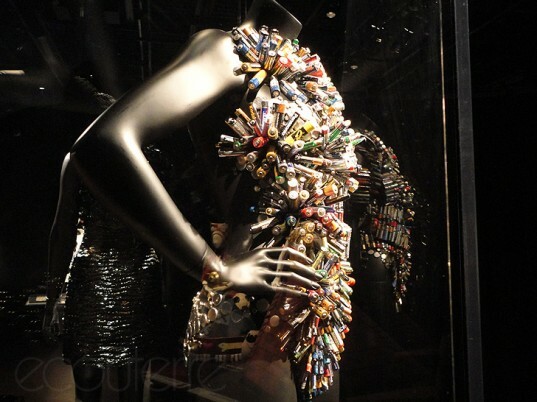 The "Caustic Swimsuit" by Jennifer Bergeron gets a charge from 1,200 alkaline batteries, which, if statistics hold true, still contain a third of their power. For her "Hit Parade" cocktail number, textile artist Valérie Bédard salvaged 870 yards of video tape; 870 yards of audio tape; 2,000 slides; and two seconds of 35-millimeter film. The hauntingly luminescent "Chapter 10: Words & Wonder" by paper artist Geneviève Oligny features 1,796 pages from 78 books, milled paper, sheet of wood, linen rope, binders, and typewriter parts. 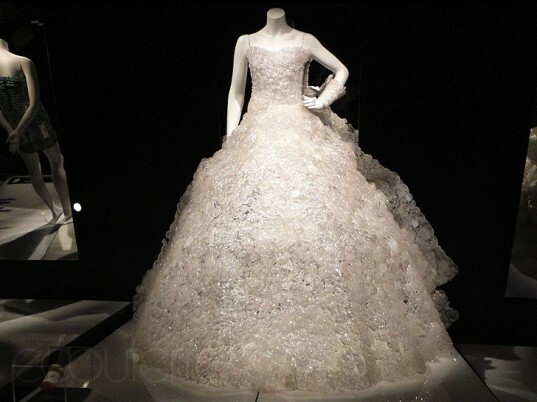 Holding court in a refrigerator is Geneviève Bouchard's "Mermaid Skin," a daring dress stitched from 97 discarded salmon skins, 320 yards of fishing line, and 40 mussel shells.